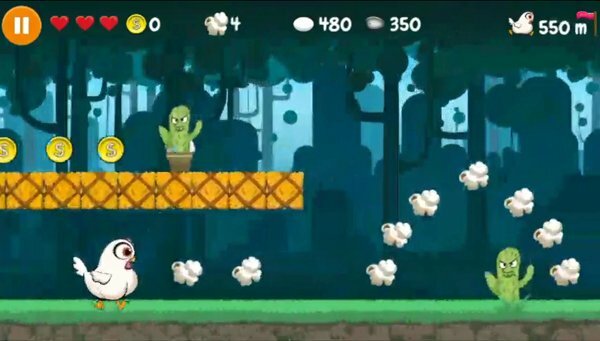 Action runner game in which you play as a brave chicken! It is not a simple chicken, it loves popcorn and shooting eggs while running. This time our chicken is going deep into woods. Fun! I like the animation! The game is a good scroller, with decent graphics, physics and animations. The game mechanics are sound, and reminds me a little of "flappy bird" but in this case you are a running bird and have to avoid the rocks and obstacles to keep moving. I could not figure out how to make the stone? egg, though I could throw the regular eggs. Maybe text during the tutorial animation would help. Fun game. I think it might be good for small kids rather than adults. I think it should have more work in menu matters. the composition (size of icons, location and distribution of the icons) is not quite friendly.